The times tables are a foundation skills for numeracy and I use these games for those students who need more time to learn. The fun associated with playing a game means they want to play over and over and this is the secret to learning - practice, practice, practice. I use games a lot and I would have used them more when I was teaching a full class, except I would not have had the time to develop them and prepare them. So now, I do AND I have. I feel very good about spending the time to make the games appealing and fun and making them available to all the busy teachers out there. I road-test them with my small groups and find out what works and what doesn't and I revise accordingly. 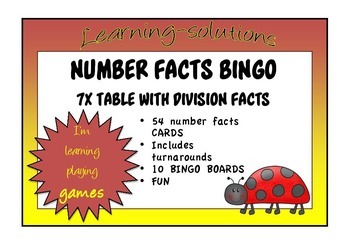 While I use these games in intervention, I have made 10 Bingo Boards so you can use them across a whole class in groups of 3. You could cater for up to 30 students that way. Give each group a board and each player has 3 counters. You could mix ability groups which is ideal as your more skilled players will help others in order to win. It is a perfect way to include your slower learners.